As a disease known as amphibian chytrid fungus continues to wipe out amphibian species worldwide, frogs in Panama are finding a safe haven in a seemingly unlikely spot—between the metal walls of shipping containers once used to transport ice cream, strawberries, coffee beans, flowers and pharmaceuticals. Two of six refrigerated containers to be donated by the shipping company Maersk Line arrived this week at Summit Municipal Park in Panama City, Panama, where the Smithsonian Institution and partners are working to save amphibians in imminent danger of extinction. The rescue pods will be part of the project’s Amphibian Rescue Center at Summit Municipal Park, which will also include a lab with a quarantine facility. After frogs are collected in the field, they will be quarantined for 30 days before being moved to the rescue pods that will serve as their new home. In addition to the two containers that are now in Panama, Maersk Line has agreed to donate two containers per year for the next two years to the project, for a total of six. Shipping company APL has also donated one container this year. Each container offers 995 cubic feet of space to house these animals. The seven together will more than double the amount of captive space the project currently has in Panama to safeguard endangered amphibians. 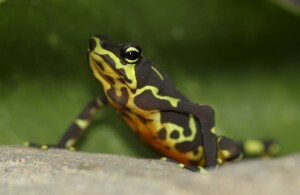 Amphibian Ark, an organization that mobilizes support for ex-situ (“out-of-the-wild”) conservation, has identified 54 amphibian species as rescue species for the Panama Amphibian Rescue and Conservation Project. At least 198 amphibian species live in Panama, of which 70 are listed as “critically endangered,” “endangered” or “data deficient” by the International Union for Conservation of Nature. Amphibian Ark estimates that about 500 amphibian rescue pods are needed to save the world’s 500 critically endangered amphibian species. 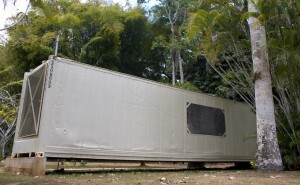 Buying, outfitting and installing a single container costs about $50,000. The mission of the Amphibian Rescue and Conservation Project is to rescue amphibian species that are in extreme danger of extinction from amphibian chytrid disease sweeping through Panama. 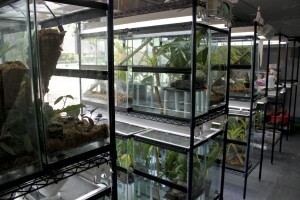 The project’s focus is on developing appropriate technologies to control the amphibian chytrid fungus, so that one day captive amphibians may be reintroduced to the wild. Project participants include Africam Safari, ANAM (Autoridad Nacional del Ambiente), Cheyenne Mountain Zoo, Defenders of Wildlife, Houston Zoo, Smithsonian’s National Zoological Park, Smithsonian Tropical Research Institute, Summit Municipal Park and Zoo New England. This entry was posted in ex-situ conservation and tagged amphibian rescue pod, Maersk, shipping container by admin. Bookmark the permalink.